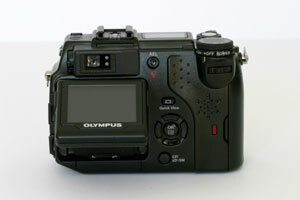 The Olympus Camedia C-5050 Zoom is one of the most advanced compact digital cameras in the Olympus range. Only the recently announced C-5060 Wide Zoom, which is basically the same as the Olympus C5050 Zoom with a wider-angle lens, sits above it in the pecking order. 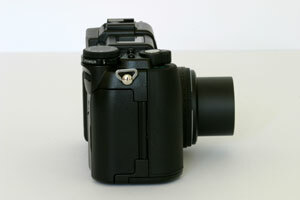 The 5-megapixel Olympus C-5050 Zoom offers a fast f/1.8-2.6, 35-105mm lens in a compact body, complete with a tilting LCD monitor. The Olympus C5050 Zoom is clearly aimed at the kind of photographer who requires full control, with a wide range of advanced photographic options, many of which are available via external buttons and switches. Is the Olympus Camedia C-5050 Zoom trying to do too much, or is it the perfect compromise between being full-featured and compact? Read my review to find out if the Olympus Camedia C-5050 Zoom has found the right balance. The recommended retail price of the Olympus Camedia C-5050 Zoom in the UK is £499.99. The Olympus Camedia C-5050 Zoom has been on the market for quite a while now, at least in digital camera terms, and it can be bought for a lot less than the RRP. 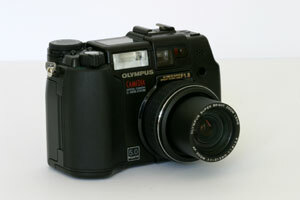 You can buy the Olympus Camedia C-5050 Zoom from PhotographyBLOG's recommended retailer, Amazon.co.uk. Free shipping in the UK! You can buy the Olympus Camedia C-5050 Zoom from PhotographyBLOG's recommended retailer, Amazon.com, for only $601.99. Free shipping in the US! 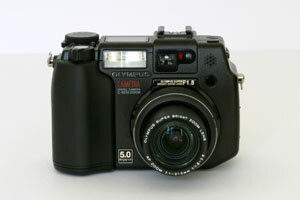 The Olympus Camedia C-5050 Zoom features a 5-megapixel CCD, which puts it at the top of the consumer digicam tree, at least until the 8-megapixel Sony F-828 is released at the end of this year. 5-megapixels will allow you to create great-looking prints up to A3 in size. One of the Olympus Camedia C-5050 Zoom's best features is it's ultra-bright f/1.8-2.6, 3x optical zoom lens, which gives a zoom range equivalent to 35-105mm on a 35mm camera. This lens isn't particularly wide or long, but the large aperture of f/1.8 means that you can handhold the camera and get acceptable results when other, slower cameras either have to be tripod-mounted or used with flash. It also allows you to blur distracting backgrounds and focus on the main subject of the picture by using a very shallow depth-of-field. 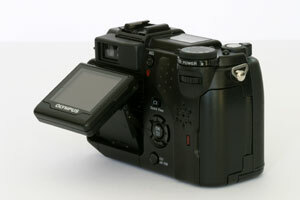 The tilting LCD monitor on the Olympus Camedia C-5050 Zoom helps you to frame scenes when shooting from difficult angles, such as from the floor or above the head. Great for macro or candid photography, as you don't actually have to lift the camera to your eye to be able to frame the subject successfully. The LCD can be tilted down 20 and up 90 degrees in 4 positions that click into place. You can't rotate it left or right, as in some more recent cameras, as the monitor pivots on a large hinge that extends along its width. The LCD monitor is a 1.8 inch colour TFT LCD monitor with 114,000 pixels, and brightness adjustment is possible. It's certainly big and bright enough to be able to use all the time, which is good as the optical viewfinder on the Olympus Camedia C-5050 Zoom is very small, so small that I gave up trying to use it after a short time. The monitor is difficult to use, however, in very bright sunlight, as it doesn't have any kind of anti-reflective coating. The Olympus Camedia C-5050 Zoom has a lot of features that give you full photographic control, including adjustable aperture and shutter speed, a fully manual setting, versatile automatic and manual functions for exposure, focus, white balance and an auto bracketing function. If the thought of all that control scares you, there are also a range of automatic program modes available, including Landscape, Portrait, Night Scene, Sports and Landscape-Portrait. 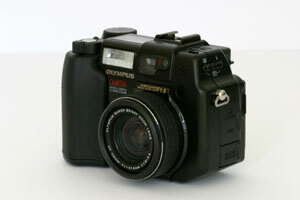 The main exposure mode on the C-5050 is Olympus' Digital ESP (Electro Selective Pattern), which is used throughout their range of digital cameras. If that fails to give a well-exposed image, there is also spot and multi-spot light metering available, a feature that many more expensive cameras don't have. There is also a very useful histogram function that you can enable to check the exposure of your photographs, either before the photo is taken or afterwards. 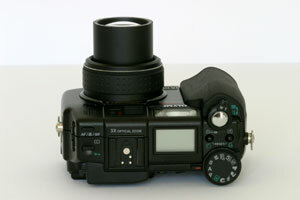 Images are recorded as JPEGs in a range of different quality and size settings; TIFF and RAW formats are also available. The built-in flash features numerous modes including first and second curtain synchronisation and has a range of 0.8 m – 5.6 m when the lens is at its widest setting, and 0.2 m – 3.8 m at its longest. 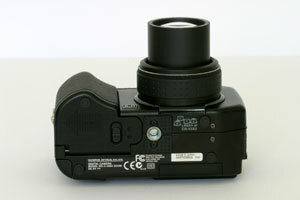 The Olympus Camedia C-5050 Zoom also incorporates a hot shoe for connecting a compatible external flash unit, and works with slave strobe lights. ISO speed is selectable on the Olympus Camedia C-5050 Zoom, You can either select Automatic and leave it up to the camera to choose what it thinks is the best setting, or select from ISO 64, 100, 200 and 400. 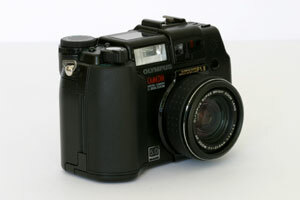 The continuous shooting performance of the Olympus Camedia C-5050 Zoom is very respectable. You can take up to 11 frames at up to 1.7 shots per second in HQ mode (excluding TIFF mode), or up to 4 frames at up to 3.0 shots per sec. The Olympus Camedia C-5050 Zoom has a motion picture mode which allows you to record QuickTime Motion JPEG 15 frames/sec until the memory card capacity is reached. It also has a range of creative functions, including 2 in 1 / Crop and Merge, Sepia mode, black & white mode, blackboard mode, whiteboard mode and panorama mode. The Olympus Camedia C-5050 Zoom is compatible with virtually all of the newer digital image storage standards, including xD-Picture Card, SmartMedia, Compact Flash and Microdrive (1Gb). So if you're upgrading from an older camera, you may find that you can keep all of your memory cards and use them with the Olympus Camedia C-5050 Zoom. The camera is powered by either 4 AA batteries or 2 lithium batteries LB-01 (CR-V3). Olympus have been quite generous with what they supply with the Olympus Camedia C-5050 Zoom camera. A neck strap, 32 MB xD-Picture Card, NiMH rechargeable batteries (4x) and battery charger, lens cap, USB cable, AV cable, software, instruction manual and a warranty card are all included in the box. The Olympus Camedia C-5050 Zoom at first glance has quite a strange design; it looks as if extra bits and pieces were added to it over a prolonged period of time. There aren't too many flowing lines in this camera, and when you first pick it up the Olympus Camedia C-5050 Zoom feels quite cluttered and confusing. After I used it for a couple of hours, read the manual and worked out what all of the external controls did, I quickly realised that the camera was designed primarily as a photographic tool, rather than as just something nice to look at. All the external controls on the camera, once you have learned what they do, make the Olympus Camedia C-5050 Zoom one of the most accessible digital cameras that I've ever used. Instead of having to browse through endless submenus via the LCD, virtually all of the important photographic controls are accessed externally by some kind of button, switch or dial. This ultimately makes it much faster and easier to operate, as a button press is always a lot quicker than remembering which menus to open. 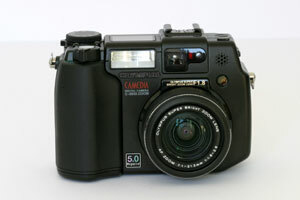 The initially awkward and ugly design of the Olympus Camedia C-5050 Zoom makes sense when you have used it for a while. When you do have to resort to the menu system to select something, it is quick and easy to access. Simply press the OK button that is positioned on the back of the camera at the centre of the four arrow buttons, then use those arrow buttons to navigate through the menu interface. 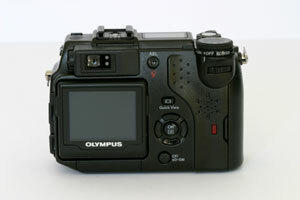 The Olympus Camedia C-5050 Zoom uses a very similar menu system to other Olympus digital cameras and will be instantly familiar if you have used one before. 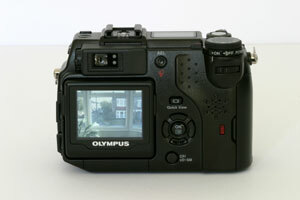 The large and bright LCD monitor on the Olympus Camedia C-5050 Zoom is excellent and a joy to use. Only very bright sunlight causes difficulties when viewing it. The monitor gives 100% coverage of the subject that you are framing and the different tilting angles mean that you can use the camera in awkward positions or for candid photography. Being able to take a photograph without actually looking like you are doing so can result in some great candid shots that might otherwise never have happened. It's a good thing that the LCD monitor is so good because the optical viewfinder is very small, dim and uncomfortable to use. My natural reaction, as an SLR user, is to frame the picture using this viewfinder, but after a few attempts I gave up and switched to exclusively using the LCD monitor. Olympus have included dioptre adjustment on the Olympus Camedia C-5050 Zoom, but frankly I can't see it being used very much simply because the viewfinder itself isn't up to scratch. The one other thing that I didn't like too much about the Olympus Camedia C-5050 Zoom is its slow start-up time of approximately 3-4 seconds from turning the camera on to being ready to take a photo. 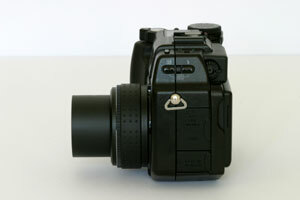 The zoom has to be extended from the camera body before the shutter can be fired. As with the Olympus µ[mju:] 400 Digital camera that I reviewed a few weeks ago, the operation of the zoom is quite noisy, especially when the camera is turned on or off but also in general operation when zooming from wide to tele and vice versa. It's fine for general photography and you will quickly get used to it, but your subject may notice the noise if it's human and close by! RAW and TIFF mode are virtually unusable as the Olympus Camedia C-5050 Zoom takes so long to write the file to the memory card. It takes 10 seconds to write a RAW file and a massive 22 seconds to write a TIFF file, during which time you can't take a picture or do anything else with the camera. This makes those file types only suitable for situations where you can take your time, like landscape or building photography. Otherwise you will have to use the JPEG settings. 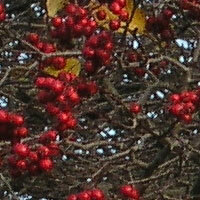 Other than those small negative aspects, the Olympus Camedia C-5050 Zoom is a joy to use. It feels sturdy and well-made and as if it will withstand nearly anything that you subject to it. More importantly it feels as if it was designed for a photographer who wants to take complete control of the picture-making process. The camera sits comfortably in one hand with all the important controls available externally on the body. The Olympus Camedia C-5050 Zoom may not be the prettiest compact digital cameras available in the shops, but it is certainly one of the easiest to use. All of the sample images in this Review were taken using the SHQ 2560x1920 mode, which gives an image size of between 2-3Mb and allows around 160 images to be stored on a 512Mb Compact Flash memory card. Noise is already starting to creep in at the ISO 100 setting, and at ISO 200 and 400 it is quite apparent in the image when viewed at 100%. Here are two 100% crops which have been Saved as Web - Quality 60 in Photoshop. The right-hand image has had some sharpening applied in Photoshop. As you can see, the out-of-the camera images, which were taken at the default Sharpening setting of 0, are a little soft. You can either change the in-camera setting (there are 5 levels of sharpening available) or use Photoshop or a similar program to sharpen the image. 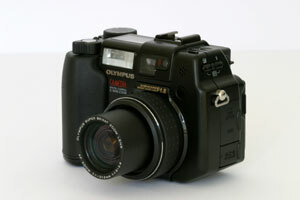 As with most digital cameras, the Olympus Camedia C-5050 Zoom suffers from some chromatic aberrations, especially in high-contrast situations. 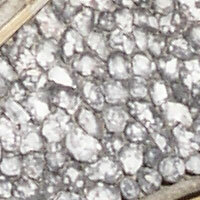 The sample 100% crop below, taken from the top-right corner of the image, shows quite a lot of purple-fringing. 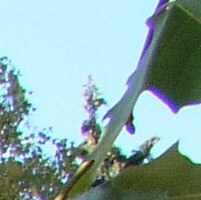 I was standing under a tree with the sun positioned just to the left of the main subject in the photograph. This was only seen, however, on a few of the sample images and only when the sun was just outside the frame. The Olympus Camedia C-5050 Zoom produces very similar results to the Olympus µ[mju:] 400 Digital camera that I reviewed a few weeks ago. The images from the Olympus Camedia C-5050 Zoom are vibrant with saturated colours. ISO 64 produces photos with very little noise, but the higher ISO settings are noticeably noisier. The images could benefit from a little more sharpening, which can either be adjusted in-camera or done later on your computer using Photoshop or an equivalent software package. Overall I was quite impressed with the images that the camera delivered, although the noise at higher ISO settings may force you to use ISO 64 and therefore a flash or a tripod for more shots that you would like. This is a selection of sample images, which were all taken using the SHQ 2560x1920 mode. The thumbnails below link to the full-sized versions, which have not been altered in any way. The Olympus Camedia C-5050 Zoom is a 5-megapixel, compact digital camera that delivers very pleasing, punchy images that can be printed up to A3 in size. It gives you full control over the creative picture-taking process with an extensive range of features. At the same time it is easy to understand and straight-forward to use, and therefore ideal for both the advanced and less experienced photographer alike. And all of this is currently available to buy for around £400 (street price). The only real downsides are the limited ISO settings, with noise apparent at ISO 200 and 400, and some chromatic aberrations in high contrast shots. Most of the other downsides to the camera are minor annoyances, rather than anything serious. The Olympus Camedia C-5050 Zoom may not be the prettiest camera that has ever been designed, it may not have the longest or widest zoom lens, and it may not be the most compact camera ever. But the Olympus Camedia C-5050 Zoom is undoubtedly a camera that serious photographers will love, and less experienced photographers will grow to love. Highly recommended.